I train Traditional Taekwondo in a small garage in Perth, Western Australia. When I say 'Taekwondo' I really mean I continue an 'American Karate' lineage, which was what I was eventually told I was learning when I first started in the US. Between 1993- 1994 I led a private training session for a small group of student practitioners before school started. We exercised a bit and then basically sparred hard for about an hour. One of my teachers visited a session one day and was shocked to see me kick a guy in the groin, and then while he was bent over halfway, knee him in the face so hard he popped back up to a standing position. It was no surprise he fed this back to my Taekwondo instructor who took me aside and very nicely, but firmly, gave me an extremely long lecture about just how easy it was to break someone's jaw and how long it would take for that jaw, wired shut, to heal. As a background to this photo, the guy on the right is my good friend Victor Gonzales. When I met Victor in 1991 he was a cancer survivor, and had lost his arm to bone cancer as a teen. You couldn't stop him from enjoying life - you can see it in this shot. He loved every bit of it. And this was what we both had in common. Victor passed on soon after graduation. Sharing both these stories for this one photo seemed to be a related learning opportunity. Some practitioners know me for a limited number of application videos I've shared online (both through The Study of Taekwondo FaceBook Group and YouTube), my focus on striking post training, and an old blog (this one) which has a training diary of sorts - of wildly varying quality covering fundamental skills and concepts of training. Observant practitioners would have noticed I often emphasize that early Taekwondo, whilst having strong links to Japanese Karate, does not need to feel inferior because of such beginnings. My argument is that Japanese Karate has its own share of political baggage. 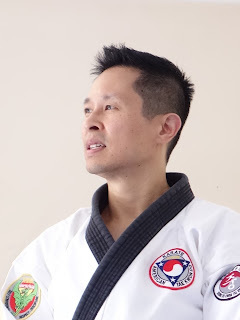 So while some might get defensive about Taekwondo's connection to Japanese Karate, Taekwondo is really an excellent opportunity for practitioners to define their own martial path. This kodak moment was taken after a Saturday morning training in 1992 at my sister's house. In the early 1990s I would be hitting the gym about 5 days a week, train officially twice a week, assisted two additional Karate for PE classes on weekdays, fought two weeknights, and then would take Sunday off. Proctor Dojo (circa 1996) is led by Sensei Mike Proctor, who I am indebted to for helping me develop the tenacity needed for hard style training. In recent years, the lessons he has shared have extended way beyond the dojo. 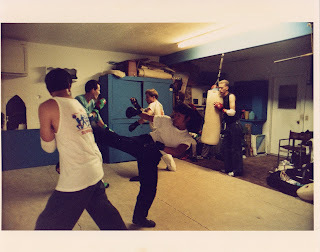 This photo is of him and the black belts whom train regularly in his converted garage. SMU Martial Arts Club I was a part of ran Taekwondo lessons on Saturday morning and Aikido lessons afterward (same with Wednesday evening classes). The Aikido class eventually converted into an aikijujutsu lineage and was named SMU Gendai Bushi Dojo. Here I am with (L->R) Ted Gambordella, Paul Hinkley, and my instructor Bryan Robbins. And that's me wearing the most ridiculous red gi top I bought because JCVD made it look so good in Bloodsport. Next, I was amazed at the amount of presentation, discussion, and opinions shared throughout the session. When I trained in Asia, no one dared speak. Even my master would speak sparingly. When he did speak, it was more like a grunt cajoling us to go at it harder, or to jump higher, or to do something faster. At SMU in contrast, you could expect anything from incisive observations to a discourse of techniques by Sensei Bryan Robbins. Mr Robbins was a tenured physical education professor and ex-Olympic coach; and was comfortable and extremely experienced teaching all levels of practitioners on how to perform certain techniques, what difficulties you might experience whilst doing it, how to land it successfully, and their accompanying applications. SMU Gendai Bushi Dojo. This shot was taken at a seminar led by the late Soke Don Angier of Yanagi Ryu Aiki Bugei, a martial arts personality with an incredible back story, and someone whom I consider has a 'genius' level martial ability. That's me on the far left. SMU Martial Arts Club was a curious place. The gathering on Saturdays just didn't compute to my Asian brain. I was told by my instructor that the club hosted various black belts from other styles, and whilst we start off with regular warmups, basic drills, and self defence applications, when we proceed to work on patterns, each group then breaks off and practices their own patterns by themselves. So while I was learning Chon-ji for instance, there would be those performing patterns from Wado Ryu, Kempo, Shotokan and sometimes patterns from Chinese stylists. Then we would regroup and spar everyone. It was this part of the class which made the club one of the best venues a black belt could hope to train at. My growing conundrum in regard to sparring was that some of the best fighters in the club were also those instructors who would stress the importance of technical precision and patterns. The level of detail they wanted was exacting. So much so I thought there were times when I felt discussions stopped us from putting in the repetitions I was used to back in Asia. Proctor Dojo circa 1990 - before I joined it, and before I widened the hole in the wall to the left and outside of this picture. For instance, whilst performing line drills of basic blocks, who would be told to pay attention to the tilt of the head, the raising of the chambering arm, the flight path of the block, the height of the blocking arm, the pull back of the chambering hand, the stance, and the breath out. Additionally, this applied to kicks too. I remember having to 'relearn' how to throw a roundhouse kick at short range. By relearn, I mean I'd never had to do a short range roundhouse before. So I had to listen to the emphasis on kicking at the horizon, the spinning of the support foot, the rotation of the hips, the attitude of the foot, the guarding hands, the snap back, the compression of the body, the re-chambering snap of the kick, and the reformation back into a defensive stance. While at some point I believed this information to be an overkill, I eventually took a leap of faith and figured it a necessary part of the training I needed. I also supplemented in-class training with my own reading and research, and sought to remember and explore every little bit of information that was offered by my instructors. And if you were interested, there wasn't any shortage of information available. Black belts spent an inordinate amount of time training, and not just training in unarmed fighting. You could see black belts after class going onto mats to do groundwork. Monthly you'd see a group go train kobudo for several hours in the afternoon. Not to mention right after hard style, you can go train soft style Aikido also led by my Taekwondo instructor. Every so often, you could also drive to other schools to visit gradings or competitions. Given black belts train free, SMU under the Southwest Taekwondo Association as it was called then was your all-you-can-eat buffet, if you so desired. Some black belts would additionally go to a by-invitation-only dojo led by high-level and well respected Karate instructor Sensei Michael Proctor. You might call these sessions a fight club and you wouldn't be too far off. Over the course of two hours all you do is fight. That's three minutes on and one minute off. The rules governing applicable techniques centred around the idea that it's okay to hurt but not to injure. Meaning, you could go for the knees or groin but you control yourself so your opponent walks out of training on his two feet. 'Control' doesn't mean that strikes aren't going to land hard on other areas. The first time I fought there, my nose was bloodied and my nerve endings were screaming at me. I was battered and bruised, kicked into the plywood wall, and was literally brought to the brink of tears. 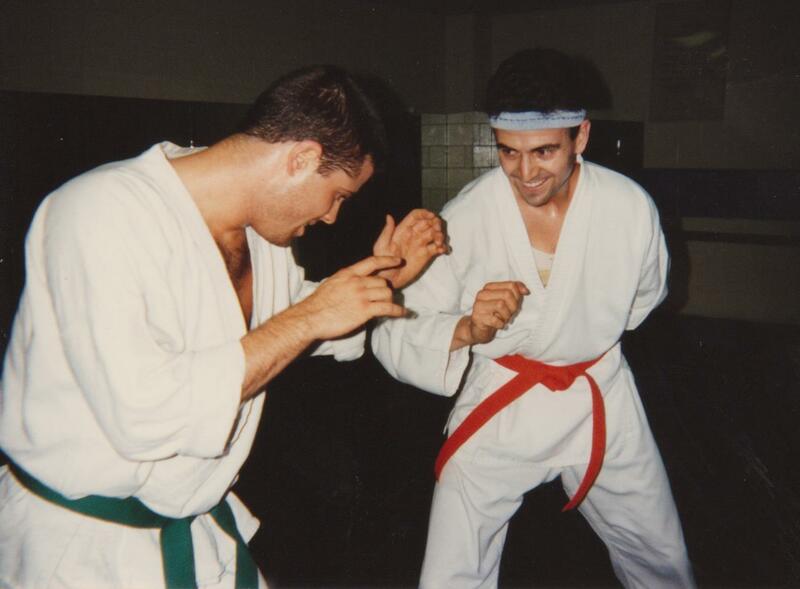 Close to the end of my time at SMU, I recall a conversation between several black belts after training one day. This one black belt was talking about how he visited a Kyokushin Karate training session, and was chuckling about how tough these guys were. He said they demonstrated how they could break baseball bats by kicking them with their shins. And then matter-of-factly said they're really tough, but when they sparred, they just couldn't touch him. The reason? They weren't as well trained as our group. I kept quiet about my surprise but I was secretly a little proud. Proud because it had taken me several years and a lot of time and effort to acquire what I felt were pretty amazing skills. And it seems such skills compared favourably against other serious stylists. But imagine my mixed emotions to hear from not one but several senior instructors that sparring is not the be-all-and-end-all of martial arts; that if you're good at sparring, all that means is that you're good at sparring. What does such conflicting information mean to my limited young black belt brain? When I look back at the training at SMU, it seemed like it was not one class, but two classes. You've got the beginner or coloured belt program, and throughout the first bit of training you'd be put through the paces and required to line drill the various basics. We'd do a couple of basic punches, sometimes combining fundamental blocks and punches. 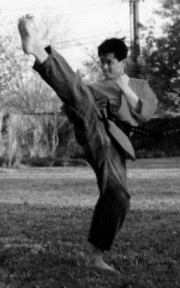 Then several basic kicks like the front kick, front leg and back leg roundhouse kicks, a side kick, and maybe a back thrust kick. Very little, if any, 'extreme' or aerial techniques were practiced. Then we'd all train as a group and work on some 'self defence' drills, which comprised of blocks, counters or takedowns. The black belts would often choose to work amongst themselves, and would run the prescribed sequences before varying it or adlibbing. It was at this point where the class became a mad skunk works between various stylists. So the question could be asked what was it that we were really practicing? I was taught Taekwondo forms, but the training we got would challenge every one there - whether you be a Taekwondo or a non-Taekwondo practitioner. Does this mean that the style only gets you so far? And then afterward becomes a launchpad from which you embark from? When I finally got good at sparring, I felt unstoppable; I no longer had the fear that plagued me when I started. Not because it wasn't painful - I had become desensitised to this kind of pain, and I knew most of my partners had excellent control. Without fear, I could see that our sparring could be described as a high-level transaction. It was like both fighters were testing their knowledge against the other, and these concepts fed our insight into fundamentals. Taking this all in, my aim with Joong Do Kwan has not been to merely replicate the conditions found in SMU. My emphasis has been to unify our training using the Taekwondo pattern set as a core curriculum; this was not something that might have worked well in that club setting because of the range of stylists. But using the patterns-as-syllabus has allowed me to seed that intense but brilliant exchange throughout our present training. 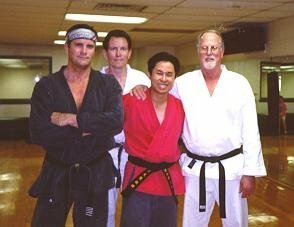 Sensei Bryan Robbins, and Sensei Mike Proctor. Some would be surprised to know I have also de-emphasized sparring as a training tool, favouring a range of sensitivity drills, traditional training tools, close quarter work, 'self defence' sequences and scenarios to build up all round skills. In my mind, this complements the pattern-as-syllabus approach, and makes for more well-rounded practitioners. It's been a long time since I left SMU, but the lessons I learned there are very close to me. Taekwondo, whether it be called American Karate, American Taekwondo, or Traditional Taekwondo, has been an opportunity for me to grow as a person. The very best Taekwondo I know will always be of that upstairs dance studio filled with a motley crew of black belts from all over who play without politics, who train without egos, and who are interested in only what works. This article was first submitted to Totally Taekwondo in April 2016 and published 22 January 2017. July 24 - Why do we share our martial arts and open ourselves up to criticism? July 25 - What role does TKD have in a post 9/11 world?